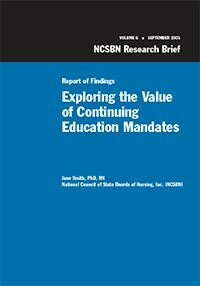 Establishment of a link between mandatory continuing education (CE) and the development of professional competence has been deemed crucial to future decision-making about the best methods of assuring the continued competence of health care practitioners. The NCSBN) Research department developed a research study to explore that issue. This report presents the results from registered nurse (RN) and licensed practical/vocational nurse (LPN/VN) study respondents. The study was conducted May through August of 2002.